With the ANC and DA entering the sensitive migration issue via an election campaign, there is a very real danger that the situation might one day spiral out beyond their control, writes Mukoni Ratshitanga. Former Nigerian president Olusegun Obasanjo has proffered advice to African political parties and citizens on the thorny issue of migration across the continent. In an exclusive interview on POWER 98.7, Obasanjo said: "Migration is something that must be handled with dexterity, with responsibility and with sensitivity on the continent of Africa." He appealed to political parties who are apprehensive of migrants to "think again". The elderly African statesman, who was in South Africa last week to attend the Southern African Development Community (SADC) Solidarity Conference on Western Sahara, said: "What you think you will gain in terms of jobs for your people by keeping other people from other countries away will amount to nothing." 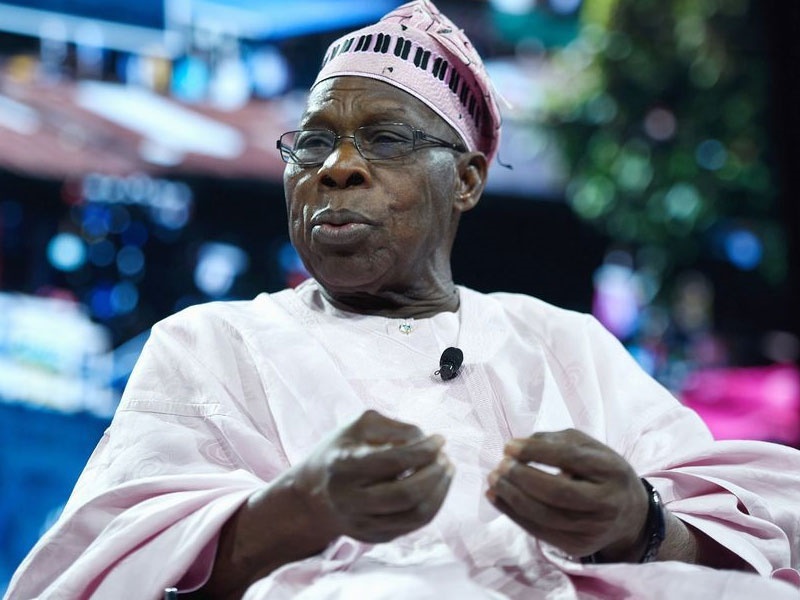 Referring to the January 1983 Executive Ordinance by the then Nigerian president, the recently deceased Shehu Shagari, which expelled over two million – most of them Ghanaian citizens – from Nigeria, Obasanjo said: "We tried it in Nigeria; it didn't work." He added: "You will know we have something … there is a particular type of bag we call "Ghana must Go". This was when Nigeria was trying to drive Ghanaians out of Nigeria. It didn't work. And if anything, it put [a] sour taste because you're now separating families." The Shagari Ordinance came against the backdrop of a cocktail of socio-economic fortunes and misfortunes rooted in the complex West African and African history. The years 1973 – 1981 witnessed a rise in the oil price – Nigeria's main source of revenue – which enabled the state to make significant investments in public works and light industries. This pull-factor brought greater numbers of migrants from neighbouring countries into Nigeria, a process further propelled by the 1973 and 1974 drought in the Sahel region. Things would predictably take a different turn by the early 1980s. The oil price fell sharply in 1981, the Nigerian economy declined, along with industrial investment, while urban unemployment – affecting two thirds of urban workers – rose. Worse still, widespread corruption during the period of the Shagari government only served to aggravate the situation. An International Monetary Fund (IMF) Structural Adjustment Programme which imposed unpopular cuts in social expenditure followed in 1983, an election year in Nigeria. The confluence of negative socio-economic circumstances impacted on the political sphere, drawing into the potent mix, migrants who, until then, had not featured prominently in the Nigerian public discourse. On January 17, 1983, the Nigerian government ordered all unskilled and undocumented migrants to leave the country within 14 days. They were accused of taking away jobs from citizens, engaging in crime and other forms of deviant social conduct, while allegations of conspiracy to register migrants as voters in the general election of August that year were levelled against the opposition. As Daouda Gary-Tounkara has noted: "It is common knowledge that in countries experiencing immigration and having difficulties dealing with crisis and unemployment, some political leaders try to scapegoat foreigners and tighten conditions of residence. This is a means of acquiring legitimacy…"
In typical rabble-rousing form, Shagari publicly stated that: "If they (migrants) don't leave, they should be arrested and tried, and sent back to their homes. Illegal immigrants, under normal circumstances, should not be given any notice whatsoever. If you break a law, then you have to pay for it." Shagari would win the elections by a comfortable margin of four million votes more than the second most popular contestant, Obafemi Awolowo. Fourteen years earlier in 1969, the Ghana government had expelled 150 000 Nigerians who had lived in Ghana for decades, eking out a livelihood as traders, workers, farmers and other professions. At the time, the Ghanaian economy was cocoa-dependent, and the commodity provided for over 70% of foreign exchange earnings. The 20 years from 1950 – 1970 witnessed a continuous decline in the world cocoa price which had dropped by 75% by 1969. A pattern emerges here: the greater the economic hardship, the louder the anti-immigrant decibels become. Nigerian academics Johnson Aremu and Adeyinka Ajayi would later note, in a paper published in 2014 that, "With Ghana's continued economic misfortunes, the Government and popular press really had no difficulty turning to aliens as scapegoats for their malaise. "The expulsion order may also be seen as an attempt by [Prime Minister] Kofi Busia to win the confidence of the masses and restore the legitimacy of his government. Since government was losing its grip on the economic survival of the country, Busia and his cabinet members were left with little or no choice than to seek solace in sending away non-nationals as a way of appeasing the anger of the masses." The consequences of the expulsions were multiple. For purposes of this article, we will consider at least three. Firstly, the Ghana Ministry of Interior was "directed to comb" the country "thoroughly" for any would-be defaulters who were accordingly arrested. Such words conjure up ideas of a siege and encourage an atmosphere in which all manner of abuses can be tolerated and triggered. Secondly, echoing Obasanjo's concern about the disruption in family life, Aremu and Ajayi have noted that, "A multiplier effect of this forced, sudden exit of Nigerians from Ghana was that it led to family disorganization and family separation. Many Nigerians who were already married to Ghanaians could not come with their wives or husbands and had to live a dejected life ever since then. Re-uniting such separated families has been less successful even after the dust of the expulsion saga had settled down." Thirdly, in both Ghanaian and Nigerian cases, bilateral relations between the two countries naturally suffered and placed a needless freeze on the regional and continental economic integration project which is vital to the resolution of many of the continent's challenges, not the least important of which is the matter of economic migration. But all of this begs many questions. Aremu posed some of these questions in a 2013 paper published by the African Research Review. He asked what progress had been made in turning Nigeria's fortunes with respect to reducing unemployment and poverty as well as diversifying and growing the economy since the 1983 purge. This would naturally include the fight against crime, which migrants were accused of spear-heading. These questions about Ghana and Nigeria equally interrogate the situation in all other African countries: does the expulsion of migrants provide a silver bullet for the resolution of a country's complex socio-economic and political problems? Last week, President Obasanjo had strong words for those who hold and propagate anti-immigrant positions. "Anybody who is a party to it," he said, "I would say he's an enemy of Africa. And if any political party is doing that, I would say, they should think again." He stressed that he, as a matter of principle, would never be party to "stopping any African from moving freely within Africa. I will never be a party to it." He said that law enforcement agencies of immigrant recipient countries should address measures against criminal conduct among immigrants rather than tarnish everyone with the same brush. "If they are criminals, of course you shouldn't allow criminals." He implored political parties to understand that migration is an age-old phenomenon which pre-dates the formation of the nation state. "Migration is what has kept the world going. And I believe that nothing should stop [it]" adding that "migrants have a lot to offer" to host countries. To illustrate the age-old nature of migration, Obasanjo drew attention to the fact that South Africa is itself a product of migrants. "This particular country, South Africa, is a country of migrants. It depends how far back you want to go from [the] 16th, 17th centuries when the Dutch first came here. Those people are part and parcel of this country. If they came in one or two ships, you would probably need thousands of ships now to ship them back. Of course, they won't go." He could have added that South Africa is also an exporter of people to other places that have now become nation states. A prime example is the AmaNdebele of Zimbabwe, who fled South Africa during the Mfecane period in the 19th century under the leadership of Mzilikazi, eventually settling in present-day Zimbabwe. These would also be part of Africans from beyond our borders who regularly come under attack by South Africans who demand that they go home! Of course, the Mfecane period predates 1886, the year European powers gathered in Berlin to divide Africa among themselves and for themselves, drawing arbitrary borders that separated people into nation states that had no relationship with local political, social, economic and cultural realities. In this context, President Obasanjo could also have said that before and after 1886, the Amaswati were and still reside in the pre and post 1886 Berlin-defined geographical spaces of South Africa as they do in the Kingdom of Eswatini, in the same way that the Batswana lived and still live in Botswana and South Africa, the Vhavenda in South Africa and Zimbabwe, etc. with the only difference being that they are now separated by a border. For the very first time since 1994, this year the immigrant question is serving as an election issue. It entered the electoral terrain in dramatic fashion when, in November last year, City of Johannesburg Mayor Herman Mashaba, generated a little storm in a tea cup; 'arresting' a man for carrying a cow head destined for dismembering and eventual sale in the informal market. Endorsing his boss' 'arrest,' David Tembe, the chief of the Johannesburg Metropolitan Police Department (JMPD) claimed that the man was an undocumented migrant. Mashaba boldly claimed that his intervention was a preventative measure against the Ebola disease, suggesting that Africans from beyond our borders are nothing but mobile carriers of disease! But the entire spectacle was suspect. It bore the hallmarks of the launch of a choreographed anti-African immigrant electoral platform by Mashaba's party, the Democratic Alliance (DA). For while Mashaba was shopping for publicity and applause by targeting a lone informal trader in the streets of Johannesburg and making emotive and offensive statements about other Africans, DA Member of Parliament Jacques Julius was simultaneously engaged in his own lengthy Twitter campaign along the South African and Mozambican border, demanding that the government "Secure[s] Our Borders". A coincidence? I have my doubts. There followed by a plethora of potentially inflammatory public statements by politicians from across the political divide about the burden placed on the country's fiscus by immigrants, the supposed unfair competition they brought to local small business owners and other remarks that provoke bigoted discourse in the public space. "The question arises and we must investigate also what the law of South Africa is saying, how can a city in South Africa be 80% foreign nationals. That is dangerous. That in Hillbrow and the surrounding areas, South Africans have surrendered their own city. The nation should discuss that particular question. "You will not find South Africans in other countries dominating a city into 80% because if we do not debate that, that necessarily means the whole South Africa could be 80% dominated by foreign nationals and the future president of South Africa could be a foreign national. "We are surrendering our land and it is not xenophobia to talk [the] truth. We fought for this land from a white minority. We cannot surrender it to the foreign nationals. That is a matter of principle. We fought for this country, not only for us, for the generations of South Africans. "The arms that are being used here in Hillbrow are arms of war which are unlicenced. The hijacking of buildings here in Hillbrow is a sign of taking over power. The question of dominance of foreign nationals in illegal trading but also in businesses that are here in Hillbrow is an economic sabotage against our people that were supposed to be those that were running those particular businesses. "We are facing here service delivery protests that we don't know where they are coming from. Some of the issues is that we cannot give shelter to our people because these buildings are being occupied and hijacked by people and lunatics that we don't know where we can be housing at least the middle class that is working here. "Those who are coming from universities at least have enough to buy their own houses and they can rent from the state and then start a new life; you know, invest and buy a proper house in future. But we can't do it because these buildings are hijacked by criminals. People are being raped there, you know. There is drug dealing there. There are shebeens there, you know. There are second hand goods amongst businesses of stolen goods by the way and all sorts of criminal activities and we must do something about it. "I want to ask the nation South Africa and the so-called human rights activists and organisations what must the police do when they are shot at by criminals? Must they sing 'Nkosi Sikelel' iAfrika or must they return fire? We are losing police officers day in and day out but we are protecting criminals who are terrorising our people. We are 52 million people. If each and every of us can be a police officer and fight against crime we will squeeze crime in South Africa." Framing the discussion this way is most unhelpful for obvious reasons, the most glaring being the use of statistics which no one knows the source from whence they are drawn. Most importantly, we close room for appreciating the benefit that South Africa receives from immigrant labour, skilled and unskilled, professionals like doctors employed in the South African public health system and the private sector, academics and others as well as the cross-cultural pollination every society requires for its own evolution and development. Perhaps the most incisive observation was observation was made by Ugandan academic, Mahmood Mamdani. Two years ago, he once implored his audience at the University of South Africa to "Make a list of countries in Africa, [and consider] their GDP. South Africa is at the top. Then make another column of the number of refugees hosted in each of these countries. South Africa is nowhere near the top." "There is a crisis in South Sudan. Three hundred thousand South Sudanese crossed the border into Uganda a few months ago. There is no public outcry. Why is there no public outcry? Uganda is a much poorer country than South Africa. It is not because the Ugandan people are less xenophobic, they are less xenophobic but why? It's not because they are naturally less xenophobic. It is because of an entire history. It is because the government has not provided the leadership in xenophobia." The two major political parties, the African National Congress (ANC) and the DA, have formally raised the issue of migrants in their manifestos and are making public calls about the documentation of migrants and tighter border controls. With these two major parties entering the sensitive migration issue via an election campaign, and so many high-ranking politicians speaking emotively in a manner that scapegoats migrants for our abiding structural socio-economic challenges, there is a very real danger that the situation might one day spiral out beyond their control, with catastrophic consequences for the human beings involved and for our country's relations with the rest of the African continent and the world. The irony of history is that it is the DA, a liberal party with very little commitment to the continent of Africa, which, in the context of a difficult election for the ANC, baited the ANC, a Pan African formation, to enter the immigrant question with haste, resorting to potentially dangerous populism. The unavoidable question the ANC needs to ponder over is whether it has lost its Pan African vision and what the implications are for South Africa's relations with the rest of the continent. Perhaps the starting point is appreciation of Obasanjo's remark that "migration is something that must be handled with dexterity, with responsibility and with sensitivity on the continent of Africa". The urgency of addressing the political dangers that attach to the mismanagement of migration obliges the continent's political leaders to demonstrate moral and principled leadership when dealing with these issues that affect fellow Africans very deeply. They should also be preoccupied with the implementation of instruments like the African Union (AU) Protocol to the Treaty Establishing the African Economic Community Relating to Free Movement of Persons, Right of Residence and Right of Establishment. It is vitally important not to lose sight of the social and economic justice imperatives at play here. The inequitable distribution of resources within and between countries is one of the drivers of migration within and beyond the continent. It also foments the resentments that lead to hostility towards migrants. It is not enough or acceptable to replace such a considered approach with simplistic and populist high-pitched shrills bemoaning the presence of migrants. To return to President Obasanjo, this issue requires political maturity evidenced by dexterity, sensitivity and deep sense of responsibility for the well-being of all Africans. Are our leaders and societies equal to this responsibility?